aumenta a eficiência e reduz os custos de produção. Módulo desenvolvido para vários de nossos clientes, com cálculos de Uptime, Paradas, OEE, MTBF, Custos, Perdas de Matéria Prima. Dados on-line e análises históricas. Software que capta dados das balanças que pesam as Matérias Primas e controla o processo de preparação dos itens para produção. Controle de Planos anuais de manutenção, ordens de serviço incluindo mão-de-obra, materiais e custo de cada O.S. Ligado ao módulo de Almoxarifado. Gestão e identificação de defeitos de equipamentos e máquinas no padrão TPM desenvolvido para nossos principais clientes em vários idiomas, chegando inclusive a ser implantado tratores de colheita de eucalipto. 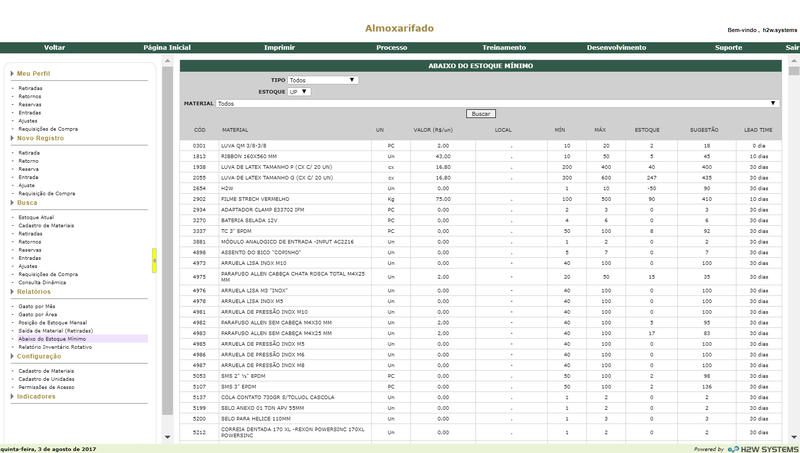 Controle de Entradas de peças, Retiradas, Retornos, Ajuste de Estoque, Requisição de compras, estoque mínimo, custos por mês, entre outras diversas funcionalidades. Desenvolvemos diversos módulos para Gestão de segurança do trabalho com controles de observações de segurança, acidentes, rondas de segurança, pss, validações de segurança, controle de documentações entre diversos outros. 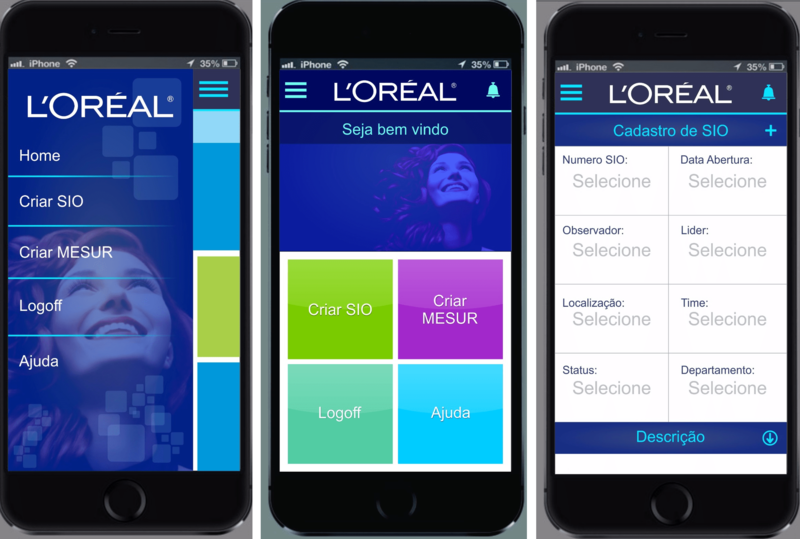 O APP Android e IOS permite o registro imediato de formulários de segurança do trabalho na L´Oréal SP. 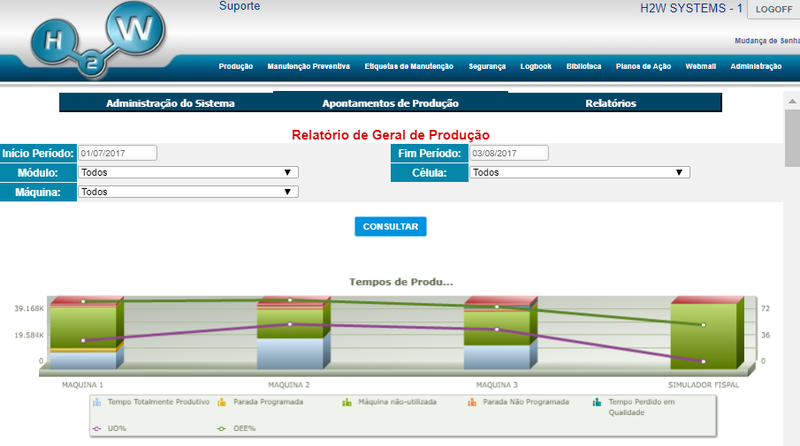 APP integrado ao software Web de gestão das principais informações do departamento de Segurança Industrial. 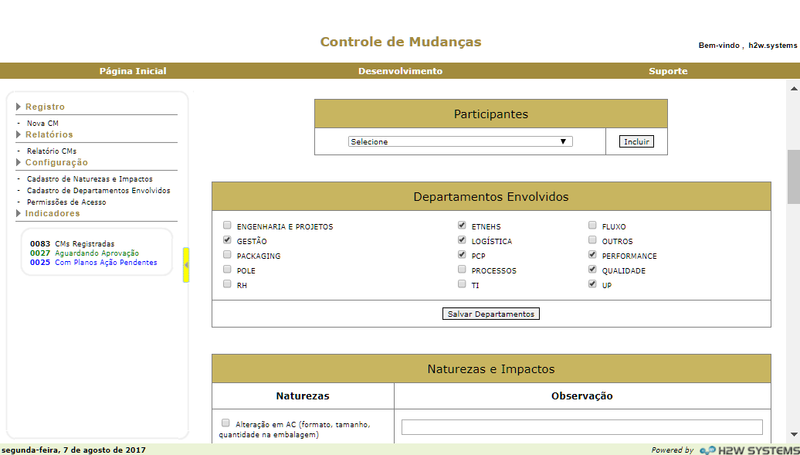 Software que organiza o preenchimento e fluxo de aprovações necessárias para realização de mudanças como a implantação de uma nova linha de produção, alterações em fluxos de fabricação, implantação de novos equipamentos, etc. Diversos controles desenvolvidos para muitos de nossos clientes, entre eles: Controle de head count, férias, afastamento, folha de pagamento, curva salarial, gestão de contratos e feedback entre líderes e colaboradores. Controle de treinamentos necessários para cada usuário de acordo com sua função, avaliações e treinamentos on-line, matriz de habilidades, personal file, etc. Geração de indicadores de desempenho para cada colaborador baseado em KPI´s capturados de outros módulos H2W® como segurança, produtividade, qualidade, etc. Possui ainda avaliação comportamental dos colaboradores e acompanhamento da evolução. Software que direciona a evolução dos funcionários da planta através de informações do posto atual e das opções de crescimento interno. Software deixa claro para todos os colaboradores os requisitos necessários para assumir qualquer posição da empresa. 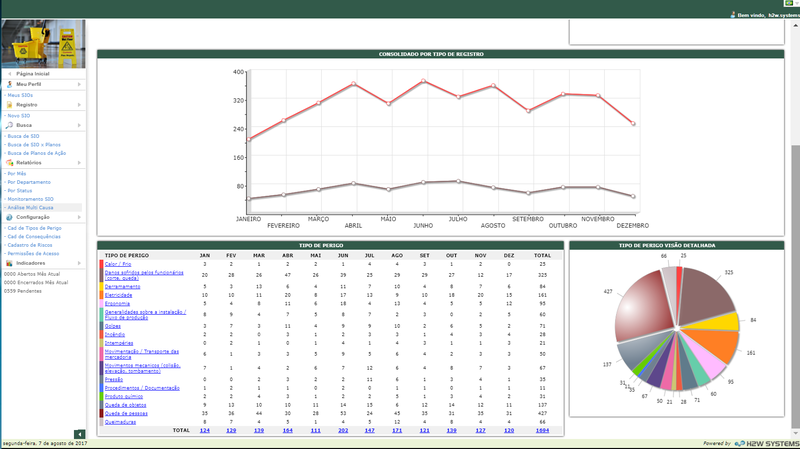 Industrial Performance Performance and Efficiency Management Module developed for several of our clients in order to measure and compare the performance in production processes, through the calculations of KPI´s and indicators like Uptime, Stops, OEE, MTBF, MTTR, Costs, Loss of Raw Material. Online data and historical analyzes. Industrial Performance CUTE - Capacity, Utilization, Time & Efficiency Software that calculates the production efficiency of each line, used in more than 50 production lines. 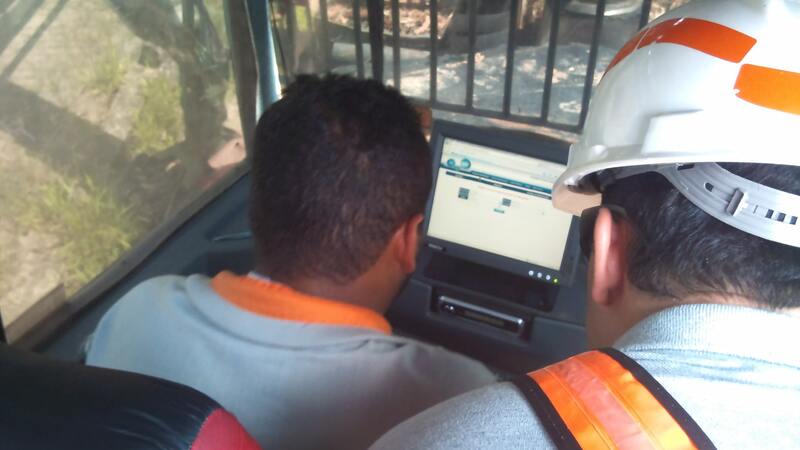 The program receives the programmed production orders from SAP, pallets produced from logistical software and stops from the machine´s PLCs to perform efficiency calculations and lost times in real time, divided by shift, according to the world standard defined by the customer. 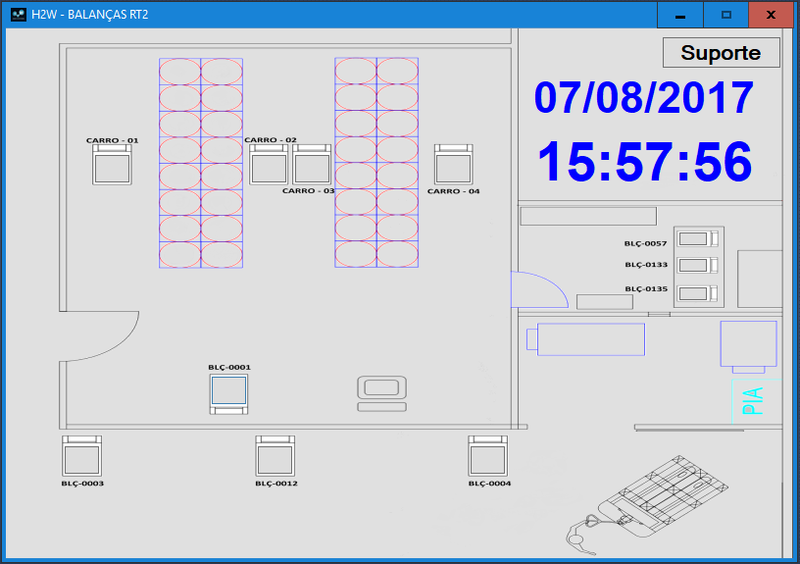 Industrial Performance Robotic Central Palletizer Software that captures data from the PLC´s and from RsLogix of the the Robotic Central Palletizer and generates reports of the stop and alert by shift, category, message and location. Industrial Performance Flexography Software that controls the production, rejects, reprocessing and stops of flexography machines, generating comparative data by machine, time, operator, product, leader and period. Production Production Programming Software that facilitates production scheduling by turn and lines, relating production by hours, quantity programmed and produced, hours worked in each schedule and calculating programming efficiency. Production Control of Weighing and Manufacture Software that captures data from weight balance that weigh raw materials and controls the process of preparing the items for production. Performance and Loss Consumption of Raw Material Software that allows the registration of raw materials consumed in polymer production equipment. The system also allowed for an optimal traceability control of materials used in each production order. Performance and Loss Loss Control Software that captures SAP information on consumption and standard of raw material of each production order and works as an Business Intelligence System, generating more user friendly reports than those available in the ERP. Workplace safety Safety Audit Software that controls the audits performed in the work place, where it is assessed if the observed employee is performing his activities within the good practices or with unsafe acts. Workplace safety Security Rounds Module that allows the management of safety rounds of work performed in various areas of the plant. The periodic rounds carry out revisions related to order and cleaning, work equipment, unsafe conditions, external companies and monitoring of the EHS (Environment, Health and Safety) department. Workplace safety Safety Validations of the Equipments Management of safety validations of industrial equipment, performed through a checklist that evaluates items such as ergonomics, exhaustion and protection. Unsafe aspects detected are corrected through the creation of action plans. Workplace safety Control of outsourced employees Management of outsourced employees through the registration of authorized activities for each outsourced and training required as integrations and NR's. The software also controls the required documentation for employees and outsourced companies. Workplace safety Inspection of fundamental aspects Module that allows inspections of fundamental and visible aspects of work safety such as the use of pedestrian crossings, electronic devices, personal protective equipment and cleaning. Workplace safety QR Code Module that allows the inclusion of QR Codes in strategic points of the plant that, when triggered, lead to files and links with safety information related to the place. Workplace safety APP IOS and Android The Android APP to Android and IOS allows the immediate registration of work safety forms. 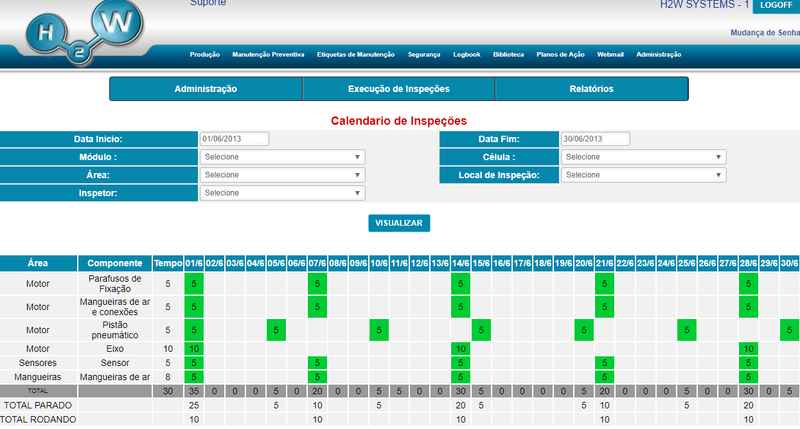 APP integrated with the Web software for managing the main information of the Department of Industrial Safety. Workplace safety Safety Scoreboard Generation of information for safety scoreboard with current days safety and records, as well as other fundamental safety information of the entire plant and by department. Workplace safety Unsafe condition control Software that allows the recording and treatment of unsafe conditions and safety and environmental improvements. 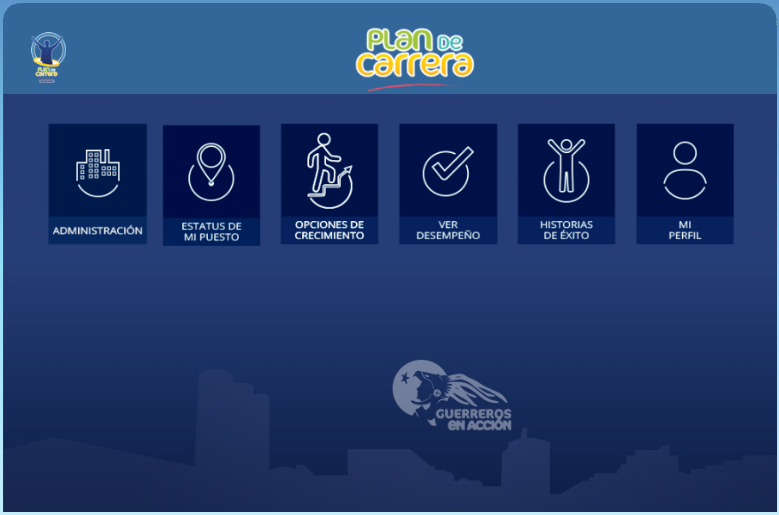 This module allows the inclusion of action plans to control the generated problems. More than 15 thousand records made in this module. Maintenance Autonomous Maintenance - TPM Software that allows the registration and management of autonomous maintenance labels. Registration is performed with the type of the anomaly, priority, requestor, stop time and performer. Maintenance Preventive Maintenance Comprehensive preventive maintenance management software including features such as manpower forecasting, warehouse items planned for execution, technical procedures and annexes, and cost forecast. Maintenance CLI - Cleanings, lubrications and inspections Preventive maintenance management software that allows the creation of inspections of various periodicities and inspectors. The software allows a balancing of inspection time per day, inspector and machine, calculating expected times of standing and running machines. Maintenance LIL Software that allows the scheduling and execution of periodic inspections of any nature, controlling the relationship between the expected and spent time beyond the fulfillment of the inspections. Maintenance Corrective Maintenance Corrective service order management software controlling items required in maintenance, planning, scheduling, stock materials, attachments, workers and execution hours and total cost of each order. Maintenance TPM - Total Productive Maintenance Label Management and identification of equipment and machine defects in the TPM standard developed for our main customers in several languages, including a version implanted in eucalyptus harvest tractors. Maintenance Predictive Maintenance Checklist Software that allows the performance of predictive maintenance checklists in production equipment, recording pressures, temperatures and speeds of certain equipment and determining if they are within acceptable limits. Centerline checklist and self-control. Performance Collector control System that allows the request of collectors to the waste generated during the production process. The system controls the process from the request of the collector, sending, confirmation of arrival, request for withdrawal and completion of the process. Performance Logbook System for recording comments related to production or other areas, improving communication throughout the company. Performance Action Plan Module that generally centralizes pendencies of several other modules, facilitating the follow-up and solution of the pending plans for each responsible one. Performance Warehouse Control Complete warehouse management with withdrawals, material returns, reservation, entry, adjustments, purchase requisition control, reports by month and area, most removed materials, materials below minimum inventory among several other functionalities. Performance B2B Software with algorithm that verifies the necessity of washing in certain production equipment according to specific rules of each case reducing cost with unnecessary washes or contamination of products by unrealized washing. Human Resources Personal Scorecard Generation of performance indicators for each employee based on KPIs captured from other H2W modules such as safety, productivity, quality, etc. It also has behavioral evaluation of employees and monitoring of evolution. Human Resources Career Path Software that guides the evolution of plant employees through information from the current position and internal growth options. Software makes clear to all employees the requirements needed to take over any position of the company. Human Resources Vacations Management Software that controls the vacation periods required for each employee. The official requests the vacation period through the system and the application is submitted for approvals of the HR and the area manager. Human Resources Payroll Management Software that reads time clocks data and calculates each employee's payroll. The module allows employees to justify delays or shortages, which are submitted for payment by the responsible managers. The data generated by the system is sent through the interface to the unit responsible for making the payments. Human Resources Feedback between leaders and employees Through this software employees are evaluated annually on aspects of behaviors and results by colleagues and leader. 360 Rating. Human Resources Salary Curves Software that contributes to the equalization of salaries from the employee level and time at which it is at the level. The system projects a curve of the salary range in which the employee should be, from these variables. Human Resources Head Count Software that controls the number of employees in each function and area of the company, comparing objectives with real and controlling hiring process, dismissal, change of areas, vacancies, requisitions of new jobs and overtime. Human Resources - Trainnings Trainings Management Management of training required for each user according to their function, area, shift or responsabilities, clearly showing the pending training of the entire company. The software allows the employees to carry out on-line training and avaliations in addition to organizing live trainings. Human Resources - Trainnings E-Learning Module that allowed employees to self-train in certain trainings, conducted directly through the software, including on-line tests and evaluations at the end of training. If approved your personal file is updated automatically. Human Resources - Trainnings Skill Matrix Software that controls the level of knowledge of each employee for each skill required in their role. Through this software it is possible to identify talents and deficiencies in all the functions and knowledge of the company. Human Resources - Trainnings Personal File Software that allows the clear vision of the training required for each user according to variables such as function, department and shift. The system also carries out the follow-up sending messages to employees with pending training. Project Management MOC - Management of Change Software that organizes the completion and flow of approvals necessary to carry out changes such as the implementation of a new production line, changes in manufacturing flows, implementation of new equipment, etc. 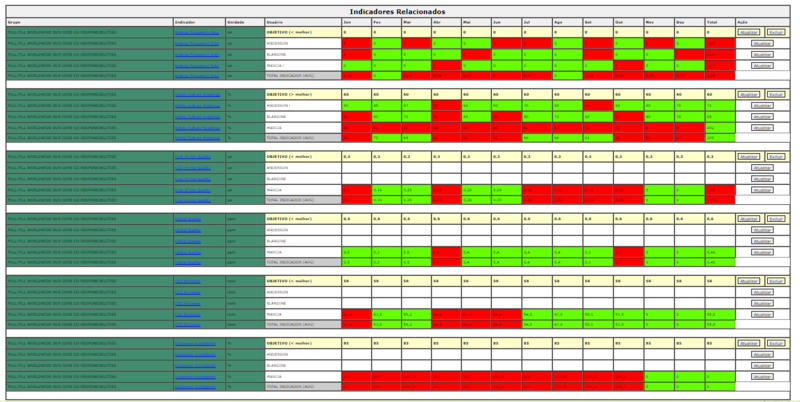 Quality Non-compliance Management Software that controls the treatment of nonconformities of finished products or process including action plans for solution of the pending and analyzes of why-why and ishikawa diagram (fishbone, herringbone, cause-and-effect). Logistics Logistics center call dashboard Software that captures information from the logistical call center and generates data on the services performed, working as a business intelligence software. Sales Order approval workflow Software that captures sales orders from Infor LN ERP software and generates locks according to pre-programmed variables such as delivery time, discount and region. Disapprovals are emailed to the representatives and approvals are released in ERP. Finance Web Based MOE System A FORECASTING TOOL that provides instant, complete and reliable costs related to production and manufacturing data. SIMPLIFY & AUTOMATE FORECASTING PROCESSES, including reconciliations at the account level. Cost estimates are made by each cost center manager at various times of the year. Actual costs are captured from SAP and compared to estimates. A H2W SYSTEMS® agrupou no ProMOS® os principais módulos de gestão de chão de fábrica desenvolvidos para seus principais clientes. O ProMOS® controla as 24 horas dos equipamentos de produção através da coleta automática de dados e gera indicadores de produtividade por operador, líder, turno, escala, OP, máquina, célula, entre diversas outras possibilidades. 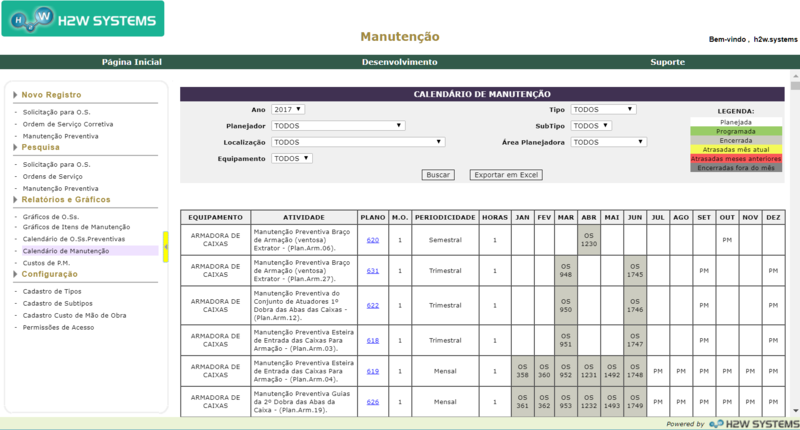 O Software conta ainda com módulos de Manutenção Preventiva e Corretiva, Logbook, Planos de Ação, Biblioteca e Gestão da Segurança do Trabalho. Conheça as principais funcionalidades e agende uma demonstração. 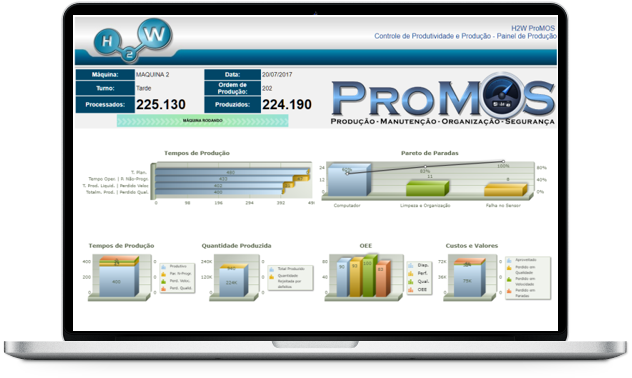 Captação dos dados de produtos produzidos e paradas diretamente das máquinas de produção através de um coletor exclusivo da H2W SYSTEMS®, gerando dados de performance em tempo real. Controle de inspeções, lubrificações, limpezas ou qualquer outra atividade periódica, que podem ser diretamente em dispositivos móveis como tablets ou smartphones. Gestão da Manutenção corretiva através de etiquetas em formato TPM. Os Relatórios permitem a visualização da porcentagem de execuções das inspeções planejadas e quantidade de defeitos levantados, além do calendário com inspeções planejadas por dia. 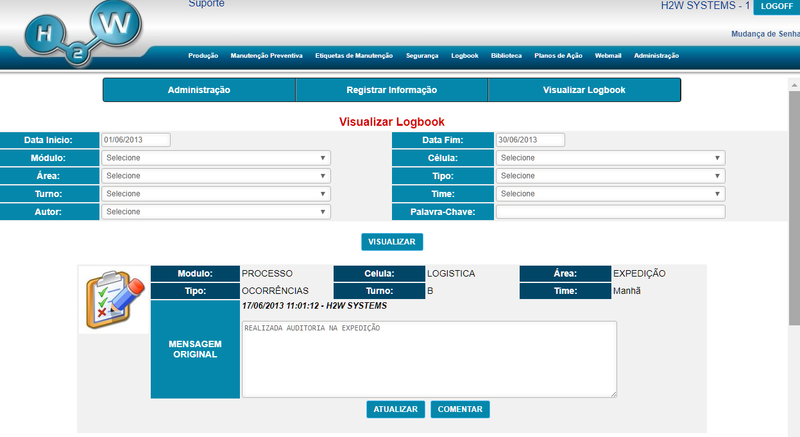 Logbook: Sistema para registro de comentários relacionados à produção ou demais àreas, melhorando a comunicação de toda a empresa. Plano de Ação: Módulo que permite a centralização das pendências de todas as áreas em formato de planos de ação com responsáveis, áreas, status, etc. Biblioteca: Armazenamento dos principais arquivos relacionados à produção como Manuais, OPL´s, Tutoriais e Imagens no mesmo software. Gestão da segurança do trabalho com objetivos de detecção de condições e comportamentos inseguros por àrea, turno, empresa terceira, período além de diversas outras possibilidades. 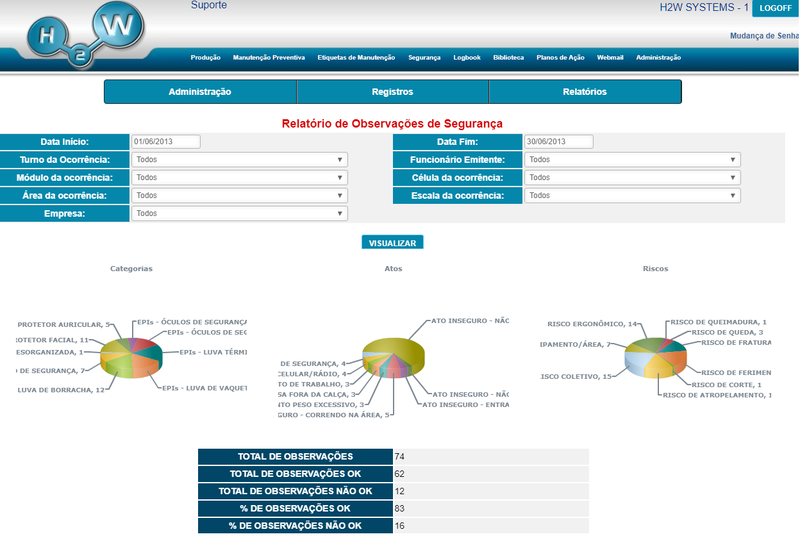 Controle de acidentes com data, horario e local da ocorrência, turno, escala, empresa, gravidade, categoria, risco entre várias outras informações. Os relatórios permitem uma visualização clara das situações inseguras ocorridas em toda a empresa.